“His comments on wind energy not only as a president, but when he was a candidate, were first of all idiotic and it doesn’t show much respect for Chuck Grassley as the grandfather of the wind energy tax credit,” Grassley said during a conference call with Iowa reporters. Twenty-six years ago, Grassley sponsored the bill that created the federal tax credit for wind energy production. 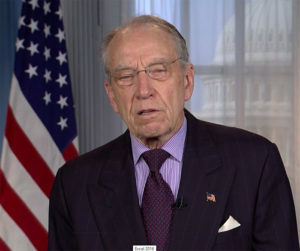 Grassley said the president was probably speaking “off-the-cuff” when he suggested property values decline when wind mills are erected nearby and the noise causes cancer. Iowa Governor Kim Reynolds is declining to directly respond to Trump’s remarks. “Here’s what I want to say: I’m proud to be a leader in renewable energy and I’m proud to say that 40 percent of our electricity is generated from wind,” Reynolds said. According to the Iowa Wind Energy Association, there are more than 4000 wind turbines in Iowa and nine-thousand jobs in Iowa are connected to the wind industry. Reynolds said she’s confident President Trump’s views won’t be a setback for the industry. “You know how those things change. One year coffee’s good for you. The next year coffee causes cancer, I mean, that’s what happens,” Reynolds said.